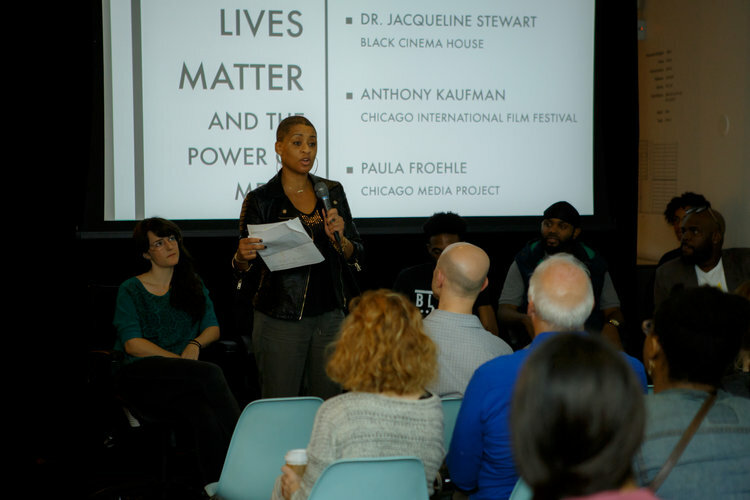 Chicago Media Project, Black Cinema House, and the Chicago International Film Festival collaborated on a panel event on October 16th with filmmakers and activists Damon Davis ("Whose Streets? 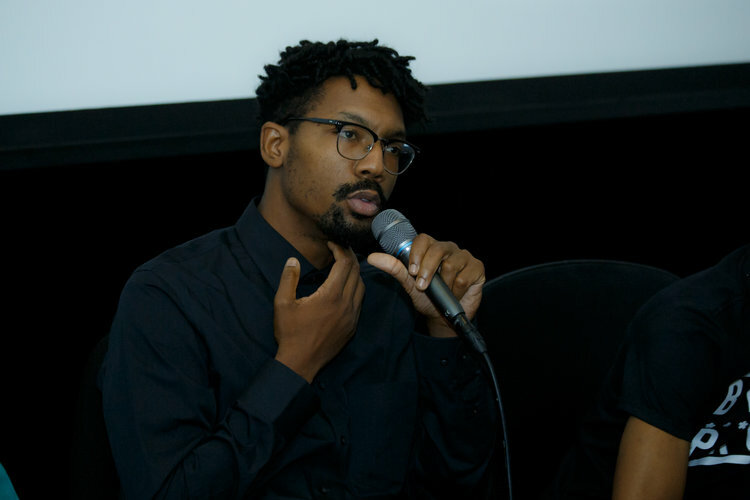 "), Aemilia Scot ("Shot"), Charles Alexander Preston (Church on the 9), William Calloway (journalist/activist), moderated by Anton Seals, Jr. Black Lives Matter has become one of the defining social movements of our times, so we asked our panel how important media is to their message, and how can filmmakers best tell the stories of contemporary civil rights struggles in the black community? A thought-provoking conversation ensued, with fantastic audience input and commentary. CMP will soon have video from the panel available -- check back soon for updates! CMP kicked off our third year of programming with two days of events connected to the Chicago premiere of ALMOST SUNRISE, a documentary following two veterans who find hope and healing from their moral injuries along a 2700-mile cross-country trek. The three events -- a film screening, Brain Trust panel, and meditation session -- truly exemplified what we mean by "impact media." Read more about the events on our blog and check out CMP's new podcast page GUINEA PIONEERS for interviews and video from the events! When: July 26, 2016, 6-9 p.m.
CMP was delighted to bring the work-in-progress film DAN THE MAN THE ARTIST to a group of our members and other supporters for a summer barbecue Big Table Dinner. Director Matthew Makar and Producer Sally Armbruster joined us to preview a sneak peak of the film and share their personal connection to telling Dan's story. 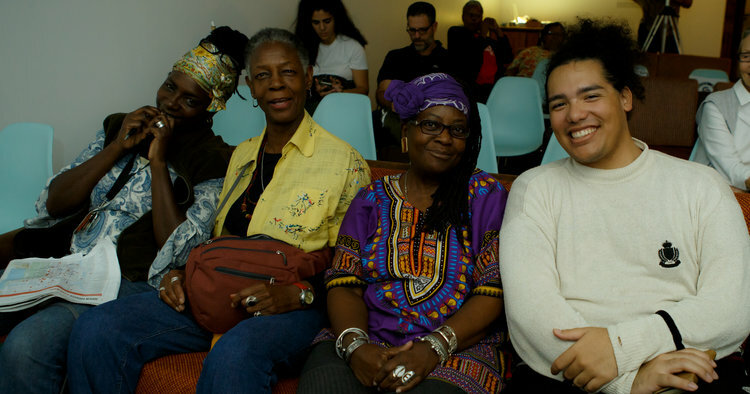 When: May 17, 2016, 7-10 p.m.
CMP hosted a screening of THE RETURN on its State(s) of Reform Tour, in advance of the film's May 23rd broadcast premiere on POV/PBS. CMP supported the film with a significant grant from our Justice Initiative in 2014, and we were proud to host the special screening of the completed project with over 100 community members and stakeholders in the field of prisoner reentry. The screening was followed by an inspiring conversation between returnees, advocates, and service providers in the Chicago area, including: Victor Dickson, CEO of the Safer Foundation; David Disabato, Marketing & Recruitment Manager in the Life Skills Reentry Program at Roosevelt University; Victor Rodriguez, returning citizen and adminstrator at Safer Foundation; Kelly Duane de la Vega, one of the film's directors; and Bilal Chatman, one of the two main subjects of the film and its campaign representative. It was a wonderful evening showcasing exactly what CMP aims to do - be a magnet for the organizations and individuals who can be moved to action by impact documentaries. We are grateful to the Roosevelt University Department of Human and Community Renewal and Temple Sholom of Chicago for their co-sponsorship of this powerful screening event. Chicago Media Project proudly presented our inaugural documentary film festival, DOC10, at the iconic Music Box Theatre in Chicago in April of 2016. DOC10 featured ten Chicago premieres of the best documentaries from 2015-16. These award-winning films represent the full spectrum of current nonfiction filmmaking, from important social issue films and captivating music docs to engaging vérité and experimental work. All ten films included post-screening discussions, as well as musical performances and special events throughout the weekend. 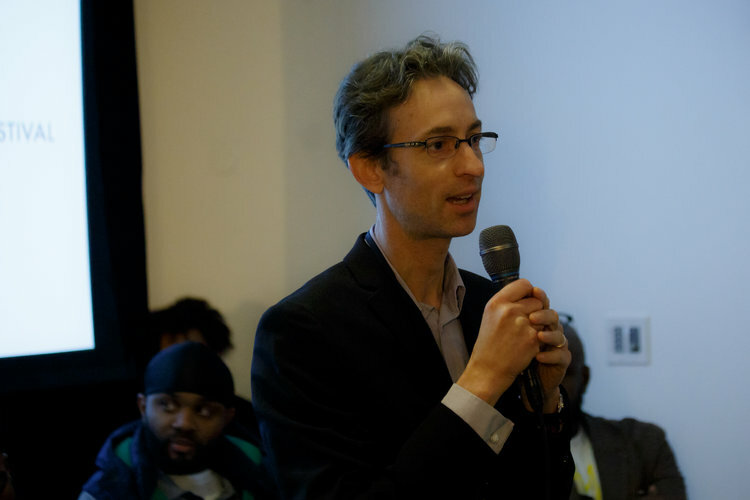 Along with our partners from the Center on Halsted and David Weinberg Photography, CMP hosted a Chicago screening of the 2015 Good Pitch Chicago film FROM THIS DAY FORWARD. When director Sharon Shattuck’s father came out as transgender and changed her name to Trisha, Sharon was in the awkward throes of middle school. Her father’s transition to female was difficult for her straight-identified mother, Marcia, to accept, but her parents stayed together. As the Shattucks reunited to plan Sharon’s wedding, she sought a deeper understanding of how her parents’ marriage survived the radical changes that threatened to tear them apart. CMP was proud to support FROM THIS DAY FORWARD at Good Pitch, where it received warm praise, generous gifts, and commitments of resource support from partner organizations. Hosting Sharon and her father back in Chicago for a screening of the completed film highlighted the amazing impact that personal storytelling can have, as Sharon and Trisha told audiences of the profound response they have received at screenings across the country. Congratulations to the whole FTDF team for a beautiful final film! When: October 29th, 2015, 6-9 p.m.
CMP members and guests enjoyed yet another delicious meal and insightful presentation at our second Big Table Dinner of the fall in the private dining room of Little Goat. After an overview of CMP's equity-investing and grant-making approaches to film from chairman Steve Cohen, our invited speaker for the evening, Ellen Schneider, led a thoughtful, interactive presentation on the idea of impact and measurement in documentary film. Schneider is a leader in social justice media strategies, currently as the director of Active Voice Lab, which builds tools — such asThePrenups and HowDoWeKnow.net — that help people use stories, art, and culture to advance social change. Schneider asked our guests to think about their own approaches to impact measurability when they consider investing in or donating to a documentary film, and then walked us through the different "garden tools" metaphors her team uses when analyzing a project to assess its impact strategy and impact metrics. CMP members came away with a sense of how both filmmakers and film funders can work together to define and track the impact of a project on its own terms, rather than comparing it to a one-size-fits-all model of measurement that cannot fully capture the range of social impact a project can have. This fascinating look into yet another side of the doc film world brings further depth to CMP's ongoing conversations with members and industry leaders about just what it means to create media that makes a difference. When: October 17th, 2015, 6-10 p.m.
CMP was honored to host multi-disciplinary artist Laurie Anderson for a special after-party following the screening of her new film HEART OF A DOG at the Chicago International Film Festival. Anderson's film - a meditation on death, memory, surveillance, and storytelling - resonated powerfully with CMP members and guests who have been part of our ongoing conversations this fall about empathy, storytelling, and new forms of documentary media. After the screening and Q&A, our partners at Elston Films generously hosted CMP at Billy Dec's Rockit Bar & Grill for an lovely reception with Laurie and special guests. It was a fantastic opportunity to meet and chat informally with a renowned artist and filmmaker in an intimate setting, just what CMP does best! CMP's Big Table Dinner Fall Launch: "Turning Empathy Into Action"
When: September 24th, 2015, 6-9 p.m. Co-founder Steve Cohen introduced the group of members and special guests to CMP's plans for year two, as we grow our community model of philanthropy to include new members, new initiatives, and new avenues of outreach for 2015-16. CMP premiered the first segment of our new short doc series of original content, 10x10 objects. The concept behind the series is to tell the stories of exonerees and others living on the margins using the vehicle of their ten most personal, cherished objects. Difficult personal stories are revealed through objects that represent hope, empathy, and support to both the subject and the viewer. 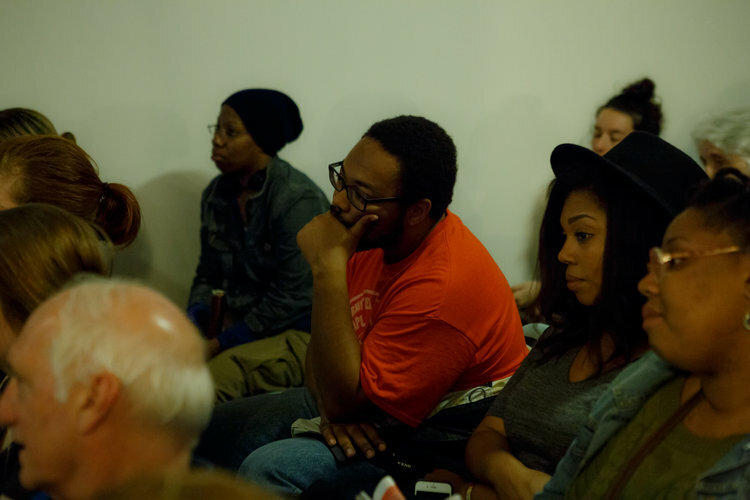 Guests watched the moving story of exoneree Kristine Bunch in the first piece from the series. Paula Froehle's conversation with Greg Jacobs marked highlights from his documentary films with Siskel/Jacobs Productions, including Louder Than a Bomb and 102 Minutes That Changed America, and clips from upcoming projects on the artist Nick Cave and early childhood education. Jumping off from Roger Ebert's dictum that "movies are the most powerful empathy machine," Paula and Greg discussed the role of empathy in documentary filmmaking, especially relationships to film subjects and the unique third perspective doc filmmakers use in crafting a distinct narrative out of the events they document. Greg told our guests that empathy must be "the entry point and the exit point for these films" as filmmakers help audiences feel exactly the pull of the story they did when discovering their subjects. Chaz Ebert closed the evening with a heartfelt reminder of Roger Ebert's continuing legacy and commitment to art as an empathy machine, sharing plans for the newly established Ebert Center at the University of Illinois to nurture diverse voices in filmmaking and film criticism. We were delighted to see so many of our returning members for 2015-2016, and to welcome some new faces to our community of "filmanthropists." What a wonderful way to kick off Year Two of Chicago Media Project!